Christmas is fast approaching! In Australia, the school year is almost at a close and there is talk about holidays and summer. Christmas is only about one month away! No, I can't believe it either! I've created an activity sheet that would work well on the Christmas table with your kids! Therapists may like to use it their sessions or give it to their students as a holiday activity. There is plenty to do on the activity sheet including a find-a-word, gingerbread man search, colouring and drawing! THIS ACTIVITY SHEET NOW INCLUDES 4 PAGES IN 2018! Christmas Fun Sheets for Subscribers! 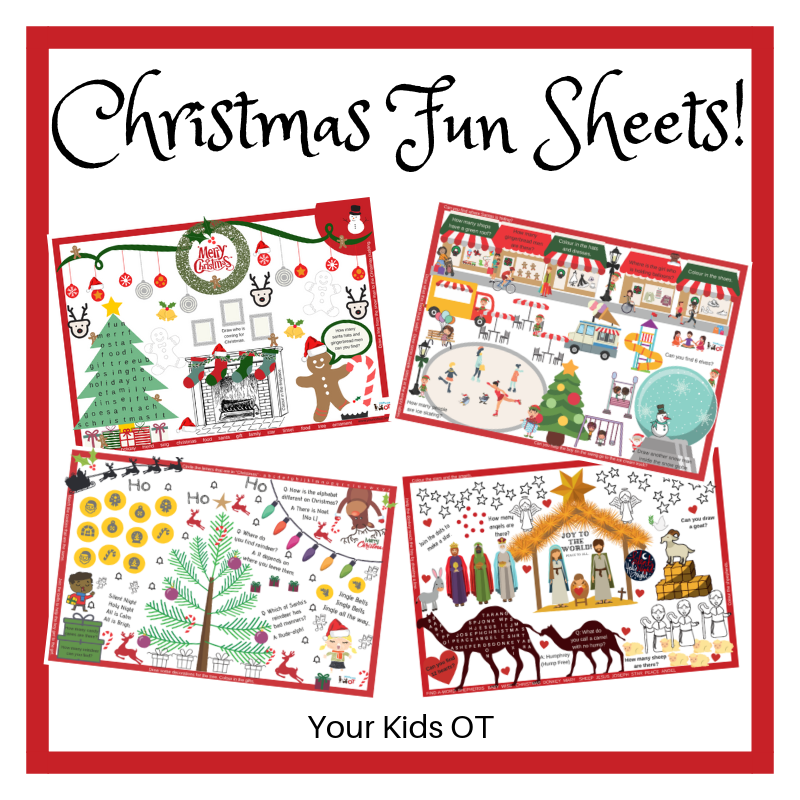 Looking for more Christmas activities and printables? Find all the Christmas activities from this site HERE! VISUAL PERCEPTUAL CONSIDERATIONS WHEN TYPING! Imagine an 11 year old girl attending an evening class at a local school with her friend. They wanted to learn how to type so voluntarily enrolled in a "word processor" course! Gosh that was a life time ago and certainly ages me! Have you even heard of a "word processor"? Keyboarding and proficient touch typing is an essential skill for the 21st century. I don't believe that it will completely make handwriting obsolete, however I would be living in a cave if I didn't acknowldege how important keyboarding and typing skills are to a student's every learning. Learning to use a keyboard and to type isn't easy! It is a false assumption that children with handwriting difficulties will learn to type easily. It will certainly help these children in the long run, however, it is important to be remember that children with motor and planning difficulties (eg, bilateral coordination, eye-hand coordination, motor planning, visual perceptual and fine motor difficulties) in handwriting will also have these difficulties when initially learning to use a keyboard to type. Accomodations for these difficulties may need to be considered when teaching keyboarding and typing skills. I learnt how to type on a word processor! Photo Credit: D. Kadavy via Flickr under the Creative Commons License. No modifications were made to the image. Hands up if you are a "2 finger" typer? Do you use your two index fingers to stab at the keyboard? Whilst there are a lot of proficient "2 finger" typers out there, I think it is important to teach kids proper finger positioning when learning how to use the keyboard! If you have a keyboard in front of you, look down at it for a moment. What do you see? white on black, black on white, something else? Did you notice what I asked you to do? Looking up at a screen then looking down at the keyboard. Did you easily find your place back up on the screen to read my suggestions? For children with visual perceptual difficulties this is one of the main issues they may have difficulty with as they look up and down and up again. They may also have to move their hands completely off the keyboard so they can see the keys. One of the main benefits of touch typing is eliminating this need to look up and down so often. Here is a look at the various aspects of visual perceptual skills required with keyboarding and typing. Eye –hand coordination is the ability to coordinate eye movement with hand movements and includes the ability to process visual information to guide hand function. In keyboarding and typing, eye- hand coordination is needed to required to press the required keys. Beginner typists will need to look for each key to be typed, look up at the screen to make sure what is typed is accurate, look down again and so on. As touch typing develops, the eye can rest on the screen and monitor what appears rather than how the hand moves. The fingers are less reliant on "sight" of letters on keys and can move more automatically. Children may also need to watch their hand guide a mouse or track ball, with constant looking up at the screen and down at their hand as they work out the visual-spatial differences of moving something on a horizontal plane and how this can affect a cursor on the vertical plane. Visual Discrimination is the ability to classify objects or shapes based on visual information such as colour, form, pattern, size or position. Form Constancy is the ability to identify an object, shape, letter, number, symbol when it is presented in a different way (eg. larger, smaller, rotated, italics, bold, different font, sideways, upside down, different colour). In keyboarding, and typing, children need to be aware that letters are produced in capital and lower case form. Most keyboards come with capital letter keys. Children need to grasp the concept of lower case letters being produced on the screen when capital letters are pressed on the keyboard. Some children will have difficulty reading certain fonts on the screen which they may be unfamiliar with. Some letters look quite different in different fonts (eg. a, g, k). Some children may also have difficulty with words written in italics and they may have difficulty with distinguishing letters because of their size on screen. Use stickers on the keyboard. There are many stickers on the market to help children to learn to type. Some of the features that stickers can help with include lower case to cover capital letters, both lower and capital letters on the one sticker, color coding so that the same finger strikes a certain colour. I purchased my keyboard stickers fromBright Star Kids. You may also find similar stickers on Amazon. You may also like to buy two sets of stickers so that you can place the "home key" stickers on your child's fingers. Change the computer font to reflect a familar handwriting font that your child is familiar with. In NSW public schools the most common font is NSW Foundation Writing. Teach proper finger positioning and touch typing. This will mean that over time, your child will not need to look at their hands when typing and they can concentrate their visual attention to the screen and what is being produced. Change the mouse or cursor options on the screen. On a PC, this may be done through the control panel. You may want to experiment with options such choosing a scheme with a large cursor (for easier visibility). I also recommend selecting the "Show location of pointer when I press CTRL key". This is helpful for those children who have trouble locating their cursor/pointer on the screen within the confusing information that may be presented on the screen. Other options include downloading animated pointers. The cursor blink rate may also be changed so that it provides the appropriate visual prompt for your child so that it is not too fast to be noticed. Position in Space or Visual Spatial Relationships. Position in Space or spatial relationships involves the ability to process information about oneself in relation with their environment in space, orientation and position. It may involved the ability to understand directional language concepts such as up/down, next to, left/right, over/under, etc. As mentioned previously, as typing and keyboarding skills develop there is less reliance on visual guidance to find the right keys on the keyboard. Over time touch typers can understand where their fingers are "in space" and in relationship with other keys to be struck without looking. This is also true for the use of the mouse and trackball. Figure-Ground is the ability to see an object or form when presented in a complex background. Visual memory is the ability to remember and recall objects, shapes, symbols or movements in short term memory. Visual memory requires visualization of what to remember. In keyboarding and typing skills, both figure-ground and visual memory skills are required to learn the layout of the keyboard. They are needed to have a map (ie. visualization) of the keyboard in one's mind so that that finding the keys becomes automatic. Difficulties with figure-ground and and visual-memory may lead to more reliance on the visual skills of looking and scanning (ie. hunting) for the correct keys on the keyboard. This will slow down the typist and can often be observed with "2 finger typists". Both figure-ground and visual memory skills are also needed to enable a child to maintain their place on the screen when looking down and then up again to keep track of what they are writing on the screen. This is further complicated if the child is copying text to type onto the scren as they are looking at the stimulus, looking at the screen, looking back at the stimulus, looking at the screen, looking a their hands and so forth. Locating the cursor/pointer may also be difficult for children who have difficulty with figure ground skills. The pointer may look like a large capital "I" when typing text and be confused with the print on screen. Well I'm please to tell you that that 11 year old girl who learnt to touch type on a word processor can now type approximately 70 words per minute. I use this on a daily basis as an OT and for this blog! BUT I also pre-wrote most of this article on paper first with scribbes here and there when I edited the order of my work and brainstormed what I wanted to cover! ​So don't throw the pen and paper away just yet! Have you enjoyed this 12 month series about Functional Skills for Kids? It has been an honour to work along side these amazing therapy bloggers. You can stay in touch with our whole team by joining us on FACEBOOK. Join THE FUNCTIONAL SKILLS FOR KIDS GROUP PAGE to be find out about the books we will producing based our this series and much more! ​Cindy Chuan is a registered Occupational Therapist practising in Sydney Australia. She has two young children who are a constant source of inspiration and learning. Cindy loves working creatively to help children to reach their potential, finding opportunities in everyday living and making learning fun. Cindy is the author of the Occupational Therapy blog Your Kids OT. ​Disclosure: Affiliate links are included in this article to promote products that I recommend. Your Kids OT is a participant in the Amazon Services LLC Associates Program, an affiliate advertising program designed to provide a means for sites to earn advertising fees by advertising and linking to Your Kids OT. Reviews and endorsements of products will only be made based on my expertise and personal opinion; and deemed worthy of such endorsement. The opinions shared in sponsored content will always be my own and not that of the advertising company or brand. ​Handwriting is a complex skill. Handwriting involves the ability to form letters with consistent letter size, proportions and spacing, so that others can read words and sentences. Producing legible handwriting requires complex visual perceptual skills as well as an integration of motor skills with these visual perceptual skills. A deficiency in visual-motor integration may be evident when observing poor quality handwriting (Volman, van Schendel, & Jongmans, 2006). Visual perception is the process where the brain extracts and organises information, giving meaning to what we see. Visual-motor integration is the degree to which visual perception and finger-hand movements are well coordinated (Beery & Beery, 2010). There are many components of visual processing which work together to assign meaning to what we see and include eye-hand coordination, figure ground, visual discrimination, form constancy, visual memory and visual-sequential memory. Eye –hand coordination is the ability to coordinate eye movement with hand movements and includes the ability to process visual information to guide hand function. When children are learning to control a pencil for handwriting, they will rely on visual information as they look at their hand and what the pencil is producing as they write. The ability to copy a vertical line, circle, horizontal line, right oblique line, square, left oblique line and an oblique cross have been recognised by therapists as an indication of a child’s readiness to integrate visual-motor skills to begin handwriting instruction. Beery & Beery (2010) recommend that formal pencil-paper instruction is postponed until a child can easily execute an oblique cross as it requires crossing the midline, which is the source of many reversal problems. They also suggest that transfer of improved visual-motor skills does not automatically transfer to academic tasks and teaching letters, words and sentences are still required. Typically children are encouraged to control their pencils and practise eye-hand coordination with tracing various lines, then shapes and then letters. These lines may include bold dotted lines, faded dotted lines, bold unbroken lines, faded unbroken lines to trace on. Children may also be provided with paths, roads or outlines to draw between to produce lines, shapes or letters. Therapist may support children with eye-hand difficulties by contrasting the path to be drawn or by emphasizing the boundary line (eg. with a raised surface). Eye-hand coordination of fine and gross motor tasks may also be encouraged prior to handwriting instruction. This may emphasize large movements before moving to small movements. Children may be encouraged to develop eye-hand coordination of larger tools before using small tools for more accurate control (eg. crayon rock before ordinary crayon). Visual Discrimination is the ability to classify objects or shapes based on visual information such as colour, form, pattern, size or position. In handwriting, children need to be aware of common characteristics as well as subtle differences which distinguish letters and words. Children need to identify letters as well as the sequential order of letters to recognize words for reading, writing and spelling. Difficulties with visual discrimination may be seen with letter reversals or lack of attention to detail in letter formation. For example. When writing “n”, if the initial line is drawn too long it appears as “h” or if the up and over section is too short it appears as “r”. When writing “a”, if the line is produced too long and below the circle it appears as “q”, if the line is produced too long and above the circle it appears as “d”, if the line is too long above and below the circle it is unrecognizable, if the line is too long and placed to the left and below of the circle it appears as “p” or if it is placed to the left and above the circle it appears as “b”. ﻿ Visual discrimination in handwriting may also be seen with confusions with the use of lower and upper case letters. Children need to be able to firstly identify letters regardless of lower or upper case formation (ie. classification) and then use these appropriately (eg. Capital letters used at the beginning of a sentence). Children with visual discrimination difficulties may require additional strategies to classify letters. Providing a multi-sensory approach to learning (eg. use of pipe-cleaners, playdough, rice, shaving foam, etc) may assist with kinaesthetic learning and muscle memory. Position in Space or spatial relationships involves the ability to process information about oneself in relation with their environment in space, orientation and position. It may involved the ability to understand directional language concepts such as up/down, next to, left/right, over/under, etc. In handwriting, difficulties with spatial relationships may also affect letter formation as described in visual discrimination as children have difficulty relating the position of lines in relation to other parts of a letter. Children may also demonstrate difficulty with writing on a line, adequate spacing between letters or words. They may have difficulty ruling up a page and maintaining writing on the left hand side of the page with the beginning of each line. Children with difficulties with spatial relationships require a range of intervention strategies to assist with this visual perceptual difficulty. This may include gross motor activities and postural control activities to encourage body awareness as well as shape positioning games such as Tangrams and felt shapes. They may also benefit from copying patterns made with blocks, LEGO models and beads before attempting to copy patterns on paper. Further strategies may include use of speciality writing paper (eg. coloured lines), grid paper, highlighting the writing line, placing a ruler on the writing line and the use of a “spacer” between words. Figure-Ground is the ability to see an object or form when presented in a complex background. In handwriting, this is needed when copying information from a source (eg. the whiteboard) and keeping track of where you are up to. Children with figure-ground difficulties may begin writing on a line and then after looking up do not know where they should write the next letter on their page. They may also miss important information or segments of a letter or a word when writing. Extra cues may be needed for children with figure-ground difficulties such as providing information on a piece of paper rather than a board, a square drawn around a word or phrase to be copied or a ruler to highlight the writing line. They may also benefit from scanning exercises. Visual Closure is the ability to process visual information when the object or word is partially hidden. In handwriting, this may affect letter formation and spelling words. Visual closure in letter formation is closely related to visual discrimination described earlier. Children may also demonstrate incomplete letter formation which affects handwriting legibility and neatness. Activities recommended in the visual discrimination section are relevant for those with visual closure difficulties. Form Constancy is the ability to identify an object, shape, letter, number, symbol when it is presented in a different way (eg. larger, smaller, rotated, italics, bold, different font, sideways, upside down, different colour). In handwriting this may result in not realising when they are having difficulty with letter formation as they may interpret their formation as accurate. For example they may see the visual closure examples above and may consider the forms to be constant (form constancy) and are unable to identify the discriminating features (visual discrimination). Children who have difficulty with form constancy may also have difficulty transitioning from printing to cursive writing. Children who experience with difficulty with form constancy may benefit from consistent use of the same writing font in the classroom, presentation of information at the same orientation that it is expected to be reproduced (eg. flat on the table when writing at the table or vertical when writing on a whiteboard). Teaching letters and words using a multi-sensory approach can help children to become more aware of the properties of shapes and letters needed for handwriting. Visual memory is the ability to remember and recall objects, shapes, symbols or movements in short term memory. Visual memory requires visualization of what to remember. This may affect a child’s ability to recognize and name shapes, letters and words. They may have difficulty remember what these “look like” without a visual prompt. For example, children may be able to copy the letters of the alphabet when it is on a desk strip, however if you randomly ask them to write various letters of the alphabet they may not recall what it looks like. They may also have difficulty remembering all the letters of a word to copy and need to “look up” to copy each letter even with familiar words. Children with visual memory difficulties benefit from playing memory card games and chunking small amounts of information at a time for writing (eg. word on a flash cards rather than a whole sheet). They may require visual aids for longer than other students (eg. use of desk strips of the alphabet). These children also benefit from multi-sensory learning especially incorporating the use of verbal cues associated with motor movements (eg. tall straight line down, up and over to draw an “h” can be creating walking on a chalk line, creating this with a skipping rope, tracing in shaving cream, writing on a whiteboard, using a ribbon to draw in the sky and using finger to write on someone’s back). Visual sequential memory is the ability to remember and recall a sequence of objects, shapes, symbols or movements in a particular order. In handwriting, this may affect letter formation with more frequent letter reversals as children have difficulty remembering the order for letter formation as well as the spatial position of the next line. This may also affect a child’s ability to write words which may have similar letters (eg. on, no, one) or a sequence of words to make a sentence. Children with visual sequential memory difficulties benefit from pairing verbal cues with motor skills as described in visual memory. Children may read and repeat letters for writing words, or read and repeat phrases and sentences for extended writing. These verbal cues may need to be said “aloud” before the child learns to internalise this and “says it in their heads”. Simple sequential memory games using physical props such as beads, blocks, pom poms may precede games using letters, numbers, shapes and words. These may be presented in increasingly large numbers and covered to be reproduced with shorter time frames over time as skills develop. Occupational Therapists use a variety of assessment tools to identify visual perceptual and visual-motor integration difficulties. If your child is experiencing difficulties with these aspects of handwriting contact a registered Occupational Therapist for a comprehensive assessment. This post is part of “Functional Skills for Kids: 12 month series by Paediatric Occupational and Physical Therapists”. You can read all of the childhood functionsHERE. Read all Your Kids OT’s monthly posts HERE. The information in this article may now be found in THE HANDWRITING BOOK! The Handwriting Book breaks down the functional skill of handwriting into developmental areas. These include developmental progression of pre-writing strokes, fine motor skills, gross motor development, sensory considerations, and visual perceptual skills. Read more about THE HANDWRITING BOOK HERE (an e-book which you can download instantly)! Beery, K. E., Buktenica, N. A., & Beery, N. A. (2010). The Beery-Buktenica developmental test of visual-motor integration: Administration, scoring, and teaching manual (6th ed.). Minneapolis, MN: NSC Pearson. ​Volman, M. J. M., van Schendel, B., & Jongmans, M. J. (2006). Handwriting difficulties in primary school children: A search for underlying mechanisms. American Journal of Occupational Therapy, 60(4), 451-460. If you have been following Your Kids OT for a while, you will know that I love printables. I love creating them, finding them and using them! I've been focusing on visual perception over the last few weeks with the launch of my visual perception reference sheet! One of the ways that I support kids I see with working on their visual perception skills is through the use of printables. I love these visual perception printables from Your Therapy Source. Your Therapy source has given my readers aspecial bundle price if you purchase all 6 of these visual perception resources. The bundle price is $18 US for all six resources if you buy them here! That is a 30% saving! Each picture below will take you to each resource with free sample pages. Visual Motor Exercises includes 25 long mazes and patterns to print, assemble and complete to practice pencil control. Connect Puzzles is a set of 50 puzzles where matching pairs need to be connected by using only vertical and horizontal lines, crossing through every box only once. In Patterns, Patterns, Patterns, children will be challenged to draw the patterns and find shapes, numbers or objects in a pattern. Lines, lines and more lines is a collection of pre-writing visual motor worksheets. Practice pencil control for vertical, horizontal, diagonal and curved lines. A set of 30Sudoku puzzles for kids. For each puzzle, fill in each 4x4 or 6x6 grid with the letters, shapes, colored chips or dice so that each items only repeats once in each row, column and square (or rectangle). Follow the Path provides over 30 pages of visual motor and visual spatial activities to complete. The special bundle package can be purchased HERE. Have you got some favourite visual perception printables? Make sure you check back to the blog soon as I have some great ideas for getting the most from using your printables (using them mulitple times)! You couldsubscribe here to make sure you don't miss an article! Sensory Treat: App for planning your sensory diet!